I'm trying to heal my relationship with my menstrual cycle which is kinda bonkers lately. 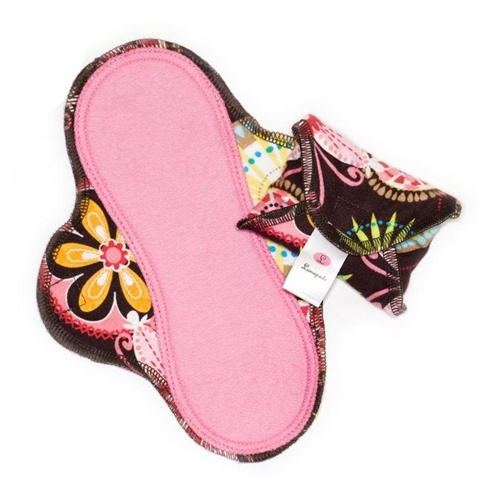 In case you are dealing with similar challenges, here are some natural resources for a healthier menstrual cycle plus info on how to get a free eco-friendly pantyliner from Lunapads, sponsor of this post and an awesome company! 5 Natural Solutions for PMS from Yoli's Green Living - I love Yoli's simple recommendations: eat a whole foods based vegan diet, exercise, eat more potassium, avoid caffeine, and consider natural supplements. Check out her blog post to read her explanations of why these things help, then poke around her website some more. It's awesome! Health Talk: All-Natural Remedy for Menstrual Cramps via Hey Fran Hey - Check out this video to see how blackstrap molasses can help reduce your cramps. Alisa Vitti's 4-Week Cyclical Hormonal Health Plan - Alisa was a featured guest on Dr. Oz this spring. This is her quick-start four-week plan to get your hormones balanced in 30 days. My plan is fully detailed in her book, WomanCode, (which I am still reading. God, I wish this was on video!) and is one of the steps of the protocol she uses with her clients at FLOLiving. Natural Remedies for PMS, Cramping, & Hormone Imbalance via Wellness Mama - This blog post is busting with info. I like that Katie includes how lifestyle factors like chemicals in food, cleaning products, and other household items can affect our fertility and hormone balance. 4 Treats for a Healthy, Eco-friendly Period - Check out my blog post to see four treats that make Aunt Flo's visit more green and less toxic, including fabric menstrual pads. If you've been meaning to try cloth pads, there's no time like the present: Lunapads is currently offering a free pantyliner sample to new customers. Read the sponsored details from Lunapads below. Curious but not sure you’re ready to make the switch? Now you can try before you buy! Lunapads offers first time customers 1 Lunapads Pantyliner sample for just $5 shipping & handling -- plus, you’ll receive a coupon for $5 off your next order.